Acne Scar Treatment Seattle | Bellevue's Dr. Philip Young's Specific Approach. We invested over 15 years to develop our Five to Seven Step procedure that treats all sorts of Acne Scars (ice pick, box car, rolling, elevated, discolored scars) as well as being done in about 2 hours. Learn More About the Acne Scar Vitalizer Treatment Today! Dr. Philip Young and our Team here at AFPS want you to find what you're looking for regarding Acne Scar Treatment. If you’re looking to improve your skin from acne with skin care, look this page up: Acne Skin Care Regimen. To the right are pages on particular scars that you may have. These links cover the particular approach for each type of acne scars. Our Acne Scar Treatment before and afters photos can give you a quick glance at what you can expect from our procedures and more. To find more links and information, visit our main Acne Scar Treatment Page. Ultimately, you may by most interested in our breakthrough approach to acne scarring called the Acne Scar Vitalizer Treatment. 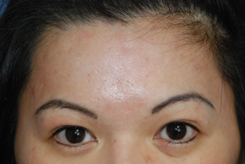 Below is a before and after picture of our acne scar treatment with the Acne Scar Vitalizer Treatment. The above treatment was done by one treatment. That is the neat thing about the Acne Scar Vitalizer Treatment. You can achieve significant improvement with just one treatment. Acne scars can be traumatic for a young individual or someone of any age. Often these physical scars carry with them deep emotionally | psychologically rooted scars that carry on into adulthood. 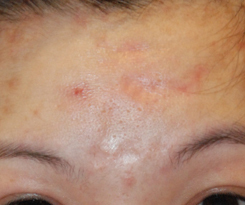 Dr. Young understands the impact of Acne Scarring and has many approaches to treating Acne Scars. We hope that people who have suffered from Acne can find out about how they can improve their scars. Our hopes are that through improving these physical | outward scars we can also improve some of these emotional and psychological scars in our patients. Plastic Surgery and the treatment of Acne scars is a big part of Dr. Philip Young’s Practice and he hopes that this page can really help people understand what is out there and the treatment options available. 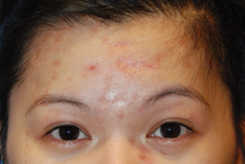 Dr. Young believes there are many ways to approach acne scarring. CO2 laser resurfacing is one of the main ways to improve general Acne scarring through Acne Scar Treatment. This technique takes the top layers of tissue and skin away. In this process, some of the scars are reduced and new skin regrows to soften and improve the scars. Dr. Young often improves these results with the addition of dermabrasion | dermasanding. He has a nice page onco2 laser resurfacing that covers some information and questions that many patients could be interested in. You can also see our special Video on co2 laser resurfacing in our Seattle | Bellevue Office here. As you will read below there are many options that Dr. Young will discuss. Based on his experience, he may suggest his new approach called the Acne Scar Vitalizer Treatment that can markedly improve your Acne Scarring with just one treatment. Dr. Young thinks this procedure will be a breakthrough for the advancement of Acne Scar Treatment. 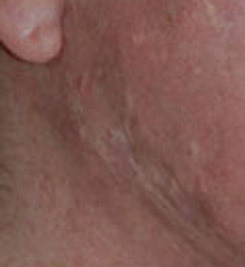 Prior to doing a resurfacing procedure, Dr. Young may suggest making more significant changes such as: excisions (cutting scars away); subcision (elevating depressed scars); tissue grafting into depressed scars; and sometimes fillers | fat grafting to volumize the tissue under the scars before resurfacing. This prepares the scars to be resurfaced so that greater improvement can be achieved. The above pictures shows a Before and After excision using the Geometric Line Closure Technique. This is an example of what can be done if you have a acne scar that leads to a linear depression or elevated scar that is solitary for the most part. 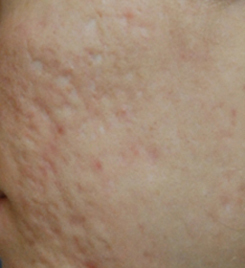 If there are multiple acne scars that appear like this we would use the Acne Scar Vitalizer Treatment instead of a geometric line closure. As you can see from the above pictures, you can get a dramatic and significant improvement in Acne Scar Treatment with the combination of Excision (Geometric Line Closure), followed by CO2 resurfacing and Dermasanding. 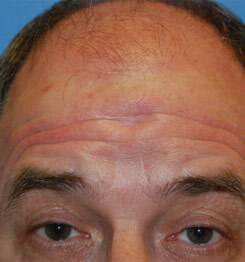 What you are seeing with the last after picture above is some redness from minor healing remnants. 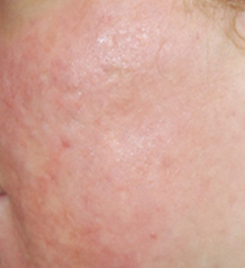 This redness eventually fades to reveal much improved skin. But in general the scar is markedly improved. Fat grafting is a way to volumize the tissue under the skin. This is important for many reasons. Fat grafting can elevate depressed scars and, hence, improve their appearance. Also fat grafting can allow the skin to heal and recover from the constant action by the muscles in the face which tend to accentuate the scars. Also through fat grafting, the skin becomes more vascular from the fat that survives. This vascularity allows the skin to heal better after other more preliminary approaches (such as excision, subcision, grafting of skin etc.). Also the stem cells in the fat can further rejuvenate and heal the skin. More surface work such as Dr. Young’s Graduated cO2 Laser Acne Resurfacing Treatment, Dermabrasion, Dermasanding. The thought for this process is that the fat grafting will rejuvenate the skin to increase the vascularity and general health of the skin. Then step 2 procedures, such as excisions, deep chemical peeling, will be better able to heal in a more preferable way. Once all of the scars are closer together in a horizontal level, the resurfacing in step 3 will be more effective in “polishing” the skin and further improving the appearance of the scars. 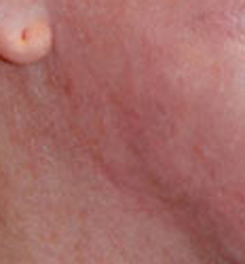 Based on his experience with the multiple approaches to Acne Scarring and his continual search to find the best options for improving Acne Scarring, Dr. Young has developed his new approach called the Acne Scar Vitalizer Treatment (this link will take you to our new page regarding this treatment). The above pictures show a before and after fat grafting session to elevate a depressed scar in the middle of the forehead that would not respond to more traditional techniques of excision and elevation, etc. 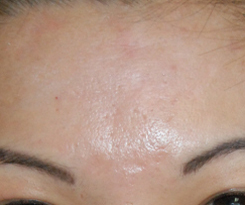 The above pictures show a before and after subcision procedure to elevate multiple depressed scars in the forehead that did not respond to chemical peels and resurfacing techniques. The second set is a close up view of the pictures above it. Click here for more Acne Scar Treatment Before and Afters. Click here for more Acne Scar Treatment Learning Videos. Fillers is another way to improve acne by there action in filling the area that is causing the depression of the scars. Sometimes this allows tissue to grow under the scars to improve them for a more semi or permanent effect. Deep chemical peeling with 80% tricholoroacetic acid (tca peel) can also be used as a technique to elevate ice pick scars. Why choose a Facial Plastic Surgeon to help me with my scars? Facial Plastic Surgeons devote 100% of their practice to the plastic surgery of only the face and neck. Our training is based on a Head and Neck Surgery Residency which gives us the greatest command of the anatomy in this area. This understanding allows us to be better surgeons in this area. Most facial plastic surgeons are also fellowship trained and they have received additional training beyond the advanced training in facial plastic surgery that they receive during their residency. Our speciality is also surgical based. We are more apt to handle the surgical approaches to the acne scar, and scars in general, revision. Dr. Young has done both Head and Neck Surgeon and is fellowship trained. 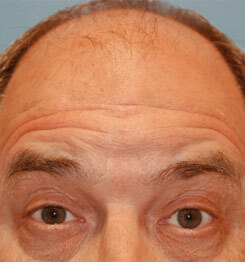 He is also board certified in laser surgery as well which makes him Double board certified. This depends on entirely what you do. Fat grafting can be more involved when you do acne scar treatment. This procedure entails taking fat from some other part of your body and then transferring it to your face and the part of your face that is affected by the scar. The more areas on the face. The more the recovery. The recovery and how you interpret how presentable you are is highly subjective and dependent on your own feelings and perceptions of your state of healing at each particular point in time. We suggest a week, plus or minus a couple of days depending on how extensively we approach the fat grafting. Excisions and subcisions take a few days to a week to recover and this also depends on how extensively these procedures are done. Deep chemical peeling takes about a week for the skin to heal over. The pink color can persist for more weeks however. Laser resurfacing takes a week or more with more traditional deep skin resurfacing. Newer technologies with Active and Deep fx can shorten the recovery to a 4-5 days. With both approaches, laser resurfacing can have persistent redness that can linger for a few weeks. But this redness can be covered up with makeup after 7 days to up to a week. With most procedures, make up can be worn after 7days to up to 2 weeks depending on how you heal.